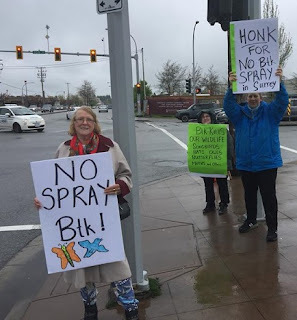 Roslyn Cassells and a few supporters were raising public awareness in Surrey yesterday about the harmful effects of BTK, the aerial spraying pesticide for gypsy moths. Instead of using the small gypsy moth traps the City has decided to aerial spray pesticide that kills all moths, butterflies and caterpillars. Consequently it also adversely effects all the animals that eat moths and caterpillars. If a songbird feeds it's baby a caterpillar that has been sprayed with the pesticide, the baby songbird dies. 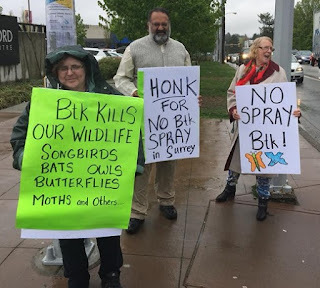 Killing all the butterflies in Surrey is somewhat tyrannical.